It can be a mixed experience revisiting a piece of your childhood, equal parts joy and surprise. I’ve been a fan of science fiction and horror and monsters ever since I was a kid in the early 1980s. As I’ve mentioned before, I was definitely a geek. I didn’t have many friends; instead most of my free time was taken up by books and movies and cartoons. The school library at Davis Elementary in New Rochelle had a handful of books about monsters, the kinds from movies, the ones from myth, and the supposedly-real creatures hiding just out of sight. These were a real pleasure for me, a momentary escape from the tedium of homework and book reports. One of the books from the library was Monsters Who’s Who, published in 1974 by Crescent Books. It was a huge illustrated encyclopedia containing profiles on a diverse selection of strange, scary beings… at least that’s how I remembered it. I hadn’t seen that book in literally decades, but last week on a whim I decided to see if it happened to be on Amazon. Much to my surprise there were quite a few used copies available dirt cheap. I ordered one for a mere 84 cents… plus $3.99 shipping & handling. You have to laugh when postage is more than four times what you’re paying for the book! The book arrived in the mail, and with it were a couple of surprises. The first was that it had a completely intact dust jacket. I’d never seen the cover before; the school library copy was missing the jacket. It’s actually a rather nice illustration. As for the second surprise… hey, wasn’t this book much bigger?!? When I was a kid Monsters Who’s Who seemed immense! My memory of it was that it was a huge, thick volume. Instead the reality is that it measures 11 by 8.5 inches and is only 122 pages. 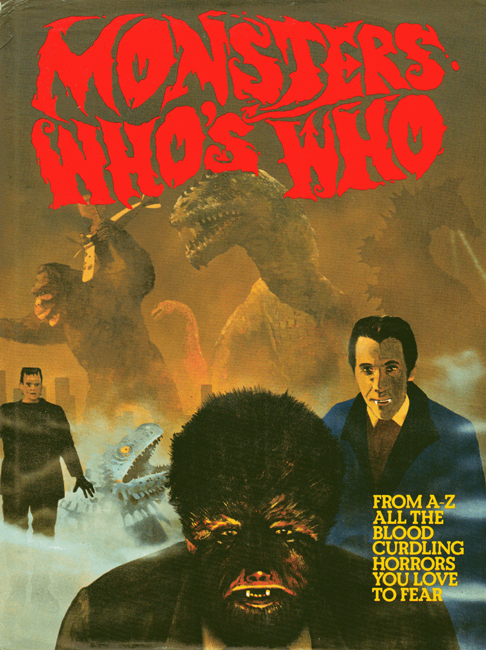 Oh, yeah, after all these years I’ve finally learned just who wrote Monsters Who’s Who. Seriously, there’s no author credit inside the book itself. But the front flat of the dust jacket reveals that it was penned by none other than Dulan Barber! Um, wait… who?!? That has got to be a pseudonym. Okay, putting aside my unreliable 30 year old memories of Monsters Who’s Who, it actually is a neat book. I’m not at all surprised that I was so interested in it when I was a kid. It contains a really diverse selection of subjects. Yes, the write-ups are for the most part extremely short. But the photos & illustrations are great. 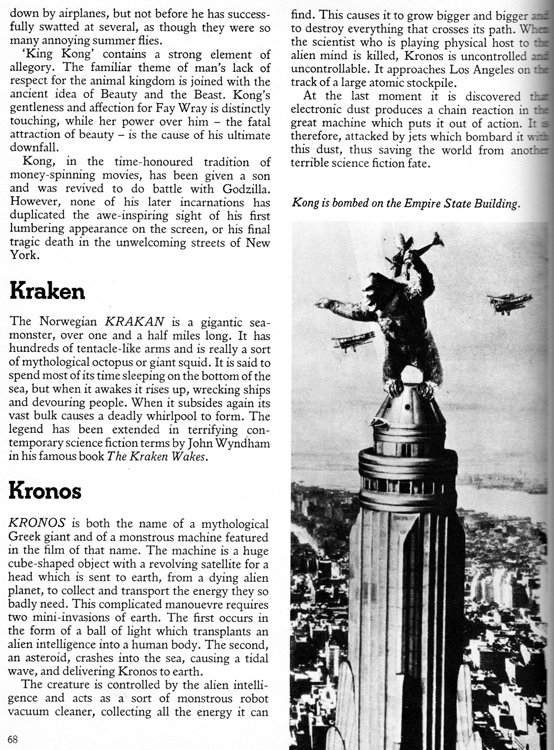 Among the absolutely-fictional entities profiled in Monsters Who’s Who are such iconic figures as Dracula, Frankenstein, the Phantom of the Opera, King Kong and Godzilla. A variety of mythological creatures including the Chimera, the Hydra, Medusa, the Sphinx and the Unicorn are also found in these pages. Third, there are the real and possibly-real beings, such as dinosaurs, the Loch Ness Monster and the Yeti. Who’s a good doggie? Who’s a good boy? 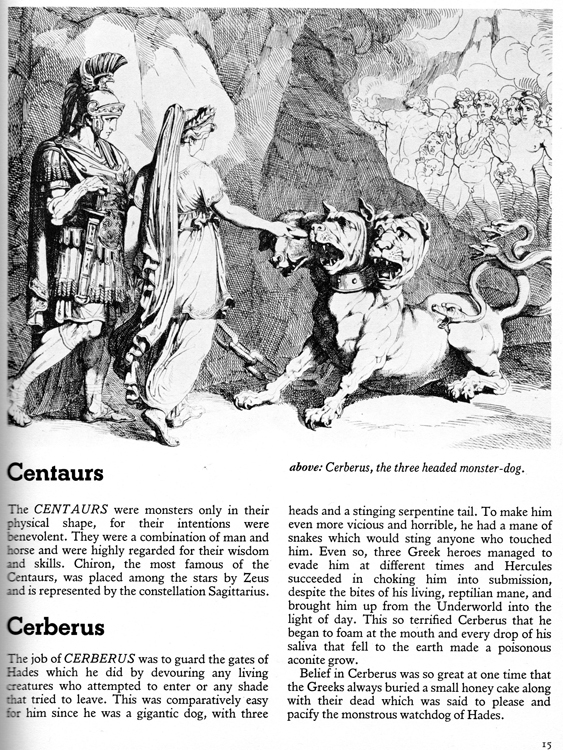 This might have been the first occasion when I heard of Cerberus, the fearsome three-headed dog that guards the entrance to the Greek underworld. Even at eight years old I found this illustration to be not so much fearsome as forlorn. All three of Cerberus’ heads wear a sad expression, as if they want nothing more than to receive a nice tummy rub! There are also a few comic book characters, specifically from the pages of Marvel Comics. I had forgotten that Monsters Who’s Who was the first time I ever learned of the oddball Incredible Hulk character known as the Bi-Beast. The Hulk himself also has a profile in the book. 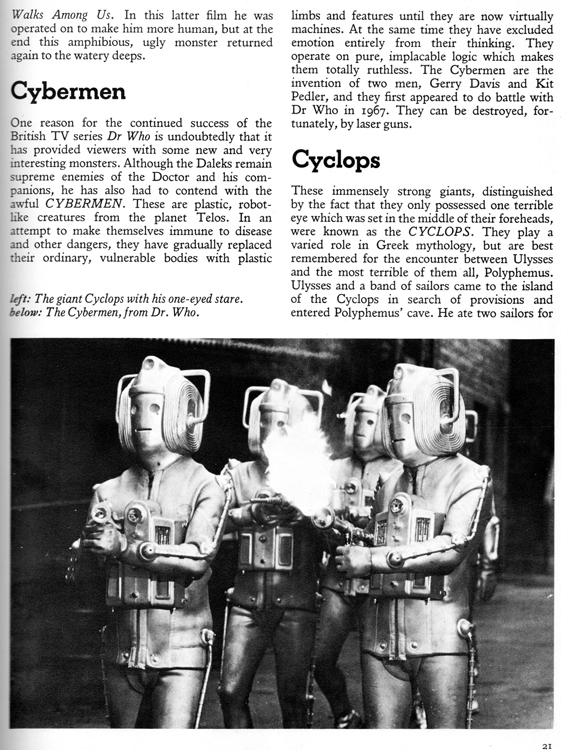 There were also a few profiles of Doctor Who monsters! Seriously, the timing of me discovering Monsters Who’s Who in the school library was perfect. I’m not totally certain, but I think it was in 1984 when I was eight years old. I had just started watching Doctor Who on PBS station WLIW Channel 21 only a couple of months before, first seeing the final season of Tom Baker and then the beginning of Peter Davison’s run. Finding this book right on the heels of that helped me understand that the show had been around for quite a few years, and that the Doctor had fought some interesting monsters in the past. I remember wondering if any of them would ever show up in the episodes I was now watching. It must have been only a week or so later and I was at home one weeknight watching Doctor Who. The TARDIS had landed in some dark caves. A bunch of soldiers armed with ray guns were searching for something, not realizing that they were being hunted by these two mysterious androids. Next thing you know the soldiers had come across the Doctor and his companions. After the usual misunderstanding where they assumed the Doctor was their enemy, they joined forces when those androids showed up and started shooting. And then the episode came to a completely shocking cliffhanger ending when the beings controlling the androids were revealed… at which point my eyes jumped out of my head. Silver robot-like creatures with handles on the sides of their heads? There’d been a photo of them in Monster Who’s Who, hadn’t there? Oh, how I wished I had the book beside me at that moment! The next day at school during lunch I broke land speed records getting to the library, grabbed Monsters Who’s Who off its bookshelf, and flipped rapidly through it. Yes, it was them! It was the Cybermen! Destroy them! Destroy them at once! That was my very first Doctor Who related geek-out. Obviously it left a major impression on me to remember it so vividly 32 years later. I know I was equally thrilled when that night episode two of “Earthshock” aired on WLIW and contained actual clips from old Doctor Who stories. I think that in the 21st Century we often take for granted the immense amount of information that we have at our fingertips. Just hop on any computer, or turn on your smart phone, and within minutes you can Google any subject or look it up on Wikipedia. You can download old movies and television shows with little effort. It’s very easy to forget how things were in the pre-digital, pre-internet age, when discovering a book like Monsters Who’s Who was like unearthing a geek goldmine. Don’t worry, I’m not going to start with one of those “when I was your age” tirades. I am not that bad. Well, at least not yet! Nevertheless it is nice to recall some of my more pleasant childhood memories. Just me and some monsters taking a stroll thru the past. I remember these books too. I don’t know if it was the same series but there was also one on robots and an amazing book about sharks with wonderful painted images of a mako breaching and a giant white shark lurking beneath a boat. One of my favorite monsters as a kid was the creature from the black lagoon. Me too! Any younger viewers who believe that you cannot create a convincing monster without CGI should be made to watch The Creature From The Black Lagoon. That movie proves that a guy in a monster suit can look cool and scary. Been looking on and off for this book for years. Thank you so much for helping me find it.